Throwing a tropical themed party any time soon? 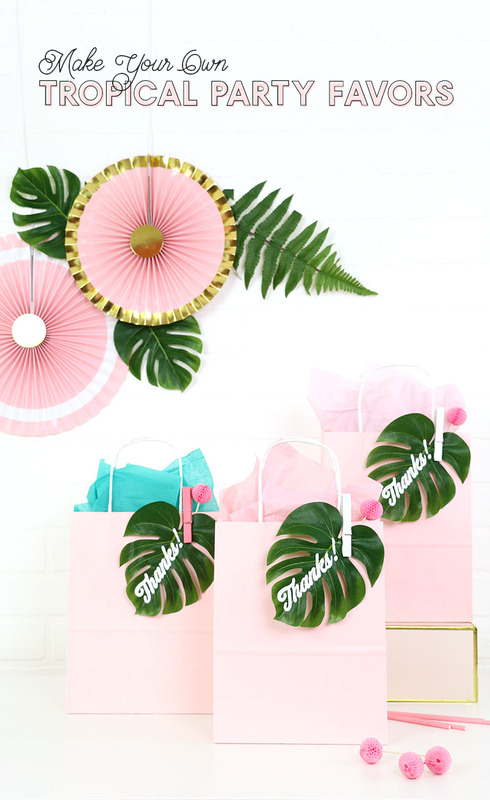 If so, you need to check out this simple and adorable tropical party favorgift idea! 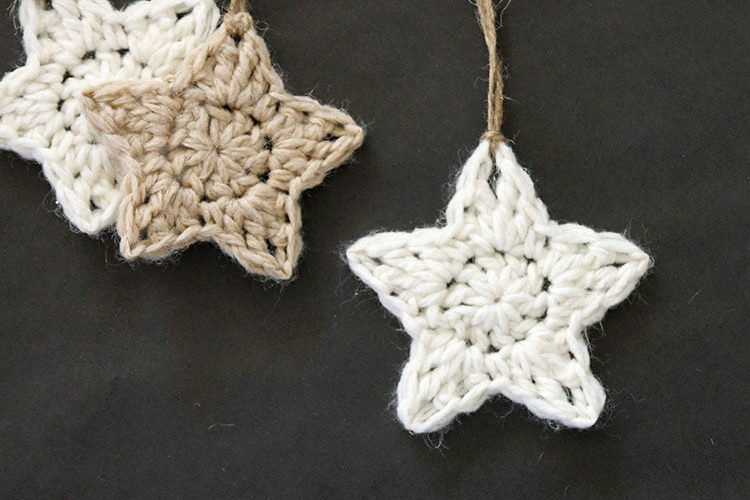 You can make your own cute gift bags super easily with this simple tutorial. I originally shared this idea at Crafts Unleashed, and this post contains affiliate links, which help to support this site at no extra cost to you. Is the tropical leaf trend played out yet? I hope not because I am still really into it. I especially love those pretty green leaves and plants paired with a pretty pastel pink. It’s such a great combo! 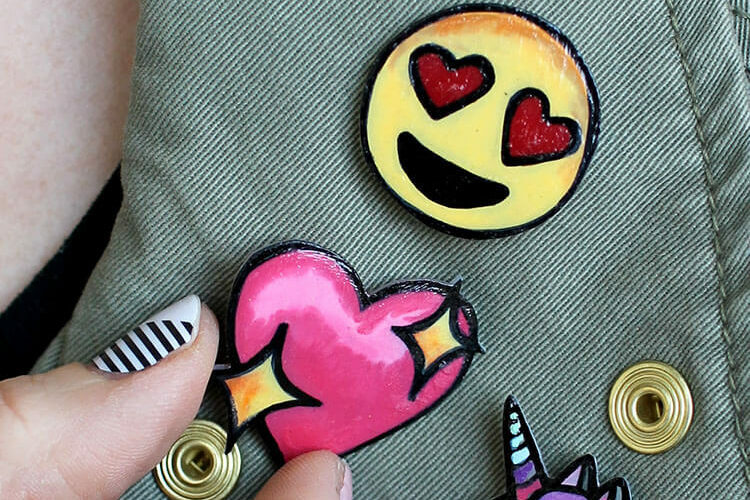 These little DIY party favor bags completely embrace that look, and I kind of love them. And they will totally make your next summer soiree a hit! Plus, they are easy to customize. If you aren’t as into the pink and green, you can customize with any color or change the wording on the leaves to whatever you like! 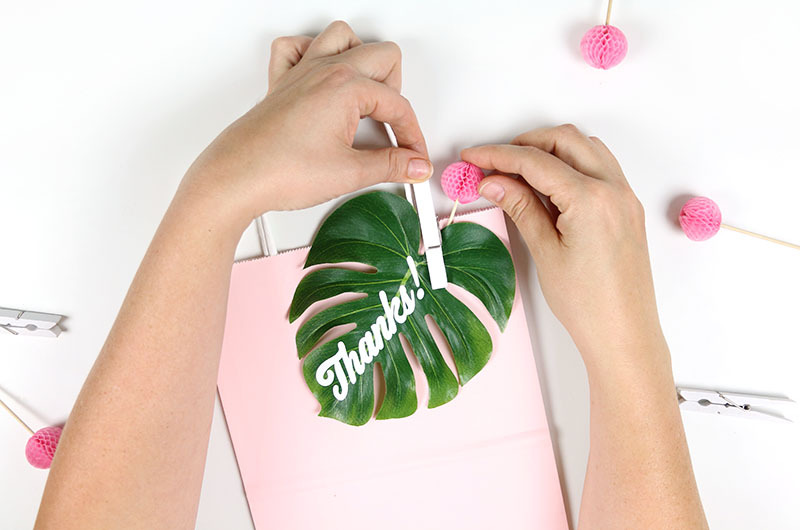 Here’s how to make your own cute tropical party favors! 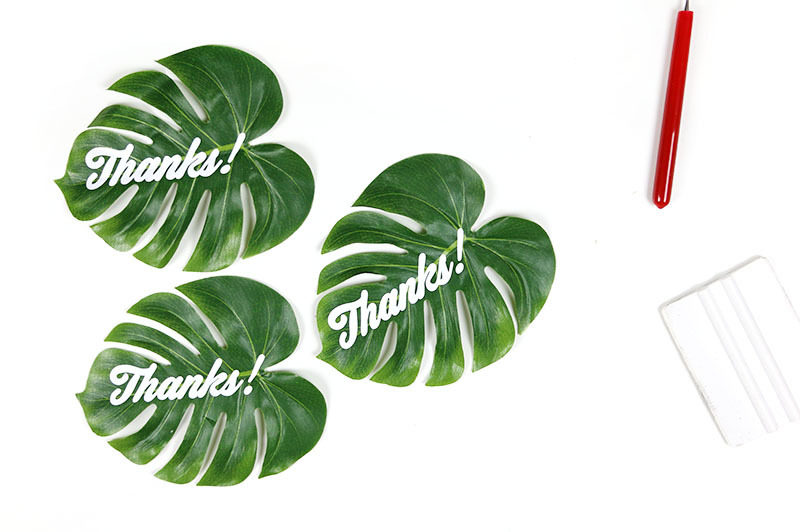 Step One – Make Tropical Leaf Tags. 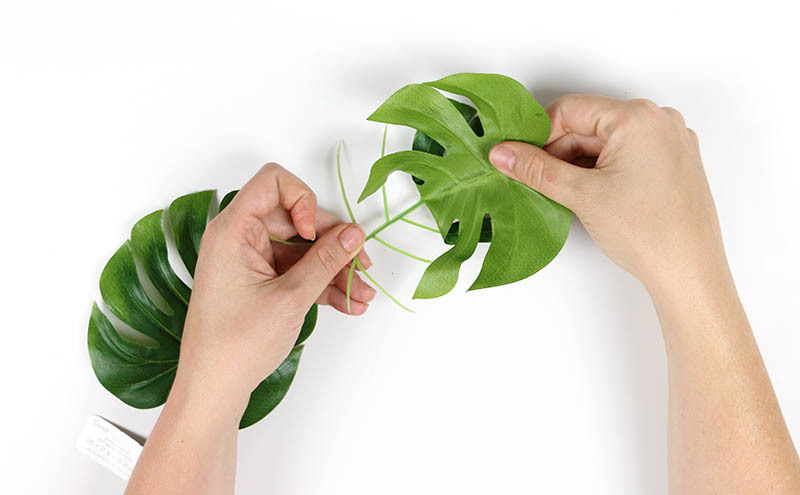 Start off by carefully removing the philodendron leaves from their plastic stems. It is fairly easy to peel them off, but be gentle to avoid tearing the leaves. Next up, we will cut the vinyl decals that will be applied to the leaves. For my favors, I put the word “Thanks!” on the leaves, but you could also put guest’s names on the leaves or whatever else you like. 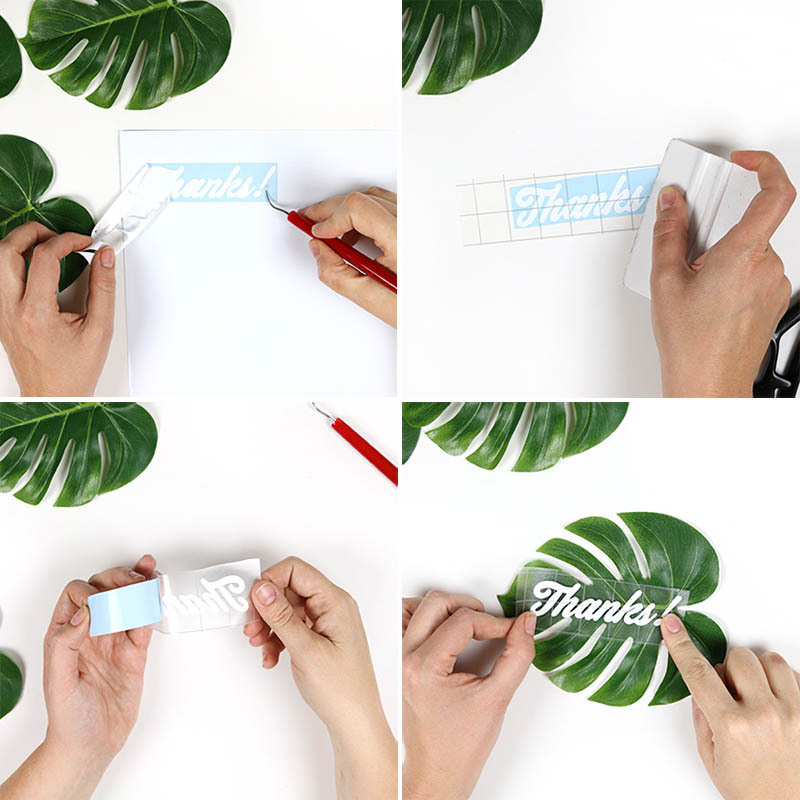 You can find the cut file for my “Thanks” design in the supply list above. Open your design in your cutting machine software and scale the design to fit on the leaves (it was about four inches long for me). Then cut the designs from the adhesive vinyl with your cutting machine. After your decals are cut, use your weeding hook (this one is my absolute favorite) to remove the excess vinyl from around the design. Don’t forget the pieces inside letters! Next, apply a piece of transfer tape on top of your decal, and peel it up off the paper backing. Place the decal onto the leaf using the transfer tape and rub it on to the leaf with your fingers or a scraper tool. Finally, when the vinyl has adhered to the leaf, peel off the transfer tape. That’s it! Your tags are all done. 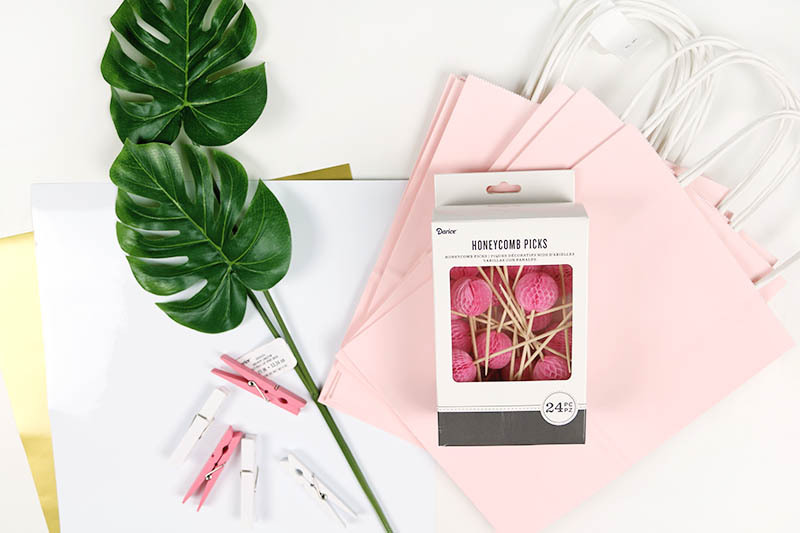 Step Two – Assemble Gift Bags. Once your leaf tags are done, assembling the gift bags is super simple. All you need to do is attach one of the leaves to the front of the bag using a wooden clothespin. Next, tuck a honeycomb pick behind the leaf, and really, that’s it! 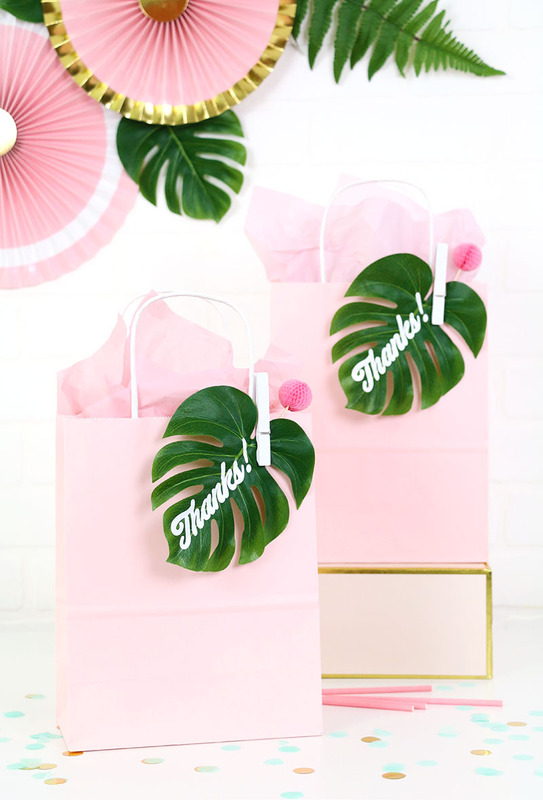 You can put any little gift or party favor you like in the bag, and it’s a simple way to add instant island style to your party! Can you use real leaves? I have never worked with vinyl before and don’t know if the pressure needed to apply it will damage a real leaf. Hmm… good question. I would think it would depend on the leaf, but I think it should work well with a thicker, fresh leaf.